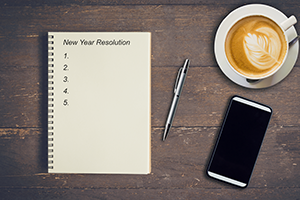 What’s Your Business’s New Year’s Resolutions? If you haven’t already, it’s the time of year to reflect back over the past twelve months, and make resolutions for the upcoming year. But, while you are sitting there thinking about all the resolutions for yourself, you should throw a few in there for your company too. Or maybe even make an event of it- get the whole company together for lunch and have everyone contribute a resolution for the business- something they would like to see happen for the company over the next year. It can be for the organization as a whole, or maybe just a personal professional resolution. Is there a way to cut costs? Maybe a certain department is using too many funds? Or another department could use some more? How about a resolution to increase the budget? If you don’t already have them, employee and management reviews are a great resolution. They help keep everyone on track and you will find that they improve the lines of communication internally for your company. They don’t have to be a headache either- most people do annual reviews, usually corresponding to the date of hire. Speaking of open lines of communication, one of the dangers of small businesses (especially as they begin to grow) is that there is no consistent process in place for sharing information between departments. For a company to really succeed, everyone needs to know what is happening within the company. A great resolution for the year would be to have a full team meeting once a month (or even just once a quarter), where each department makes a brief presentation for everyone else. This gives every member of the company a chance to contribute to the organization as a whole, and really helps foster a team-oriented atmosphere. Another great way to help foster that team feeling within the company is to have a meeting, close to the beginning of the year, where you talk about the goals and vision for the company. It may be the responsibility of the management to decide on and guide the vision for the company, but you can bet you will get there a lot faster if everyone else on the teams feels like they have a stake in it too. Have a discussion about whether or not you are actually achieving your vision, and then get some ideas on how you can improve. You will be surprised at the results. There is no such thing as knowing everything. There is always something else we can learn, some other way we can grow, both in our personal careers and as a company. A great resolution is for everyone in the company to choose one new thing they want to learn about (that relates to their field) for the year. And you will find, that as you learn more and grow as individuals, it will contribute to the overall success of your company. Wishing you a happy and healthy New Year! Let’s make 2014 a great one!